THE SEASON OF excess is well and truly over. And is anyone else almost a little relieved? January is the perfect time to get back onto an even keel and start afresh for the year ahead. New diaries, new calendars, and new plans for the brand new year. In order to make all that a little bit easier for you, we’ve put together some handy and simple ways to make sure your best intentions turn into reality in 2017. Let’s think positive people! Look at your dinner plates like a game of clean eating tetris, made up of different pieces that fit together. Check out the above plate – the bottom right section is protein, which should make up 25% of your meals, then fruit, leafy greens and veg should make up 50% (but actually, feel free to have as many of these as you like), and the final 25% is for starch or carbohydrates. The optimal type of carb for healthy eating is a whole grain. Speaking of plates, it’s recommended that you fight portion distortion by using the same dinner plates every evening – and don’t forget to adjust this for the kids by using smaller plates. Switch off the telly when you eat, and sit up at the kitchen table. Make sure you’re conscious of what you’re eating and don’t find yourself mindlessly milling into something. Serve treats like crisps in little bowls rather than the bag to ensure you’re in control of the amount you eat – and freeze or chill leftovers right away to avoid temptation to nibble. Make this January the month you get into juicing. You can get all sorts of goodness and nutrition into them, and with the right mix of ingredients, they’re like a milkshake or smoothie. Add super-foods like Manuka honey (said to have antibacterial qualities), or milled linseed (a source of Omega 3 fatty acids), and even some avocado (full of potassium, fibre and good fats). As well as all your favourite fruit and veg, of course. Bottoms up. Adding some weights to your usual workout plan – even if that’s something as simple as incorporating them into a walk around the estate every evening – can work wonders. It can strength your core and help you tone up without even thinking about it. With all the focus on our bodies in the New Year, there’s a risk we can forget about our minds. Take a few minutes at bedtime to relax and de-stress with some breathing exercises before you fall asleep. Inhale for a count of four and then exhale for a count of four, keeping as much of your breathing in your nose as possible. Another tip is to breathe so that you can feel your diaphragm inflating as well as your lungs. Two ways to ensure you reach the goals you set? Firstly, get others involved. That could be the whole family (kids and partner too) or just a mate who also wants to get into shape. Secondly, set targets and reward yourself. One way to combine these two techniques is with a monthly reward chart. 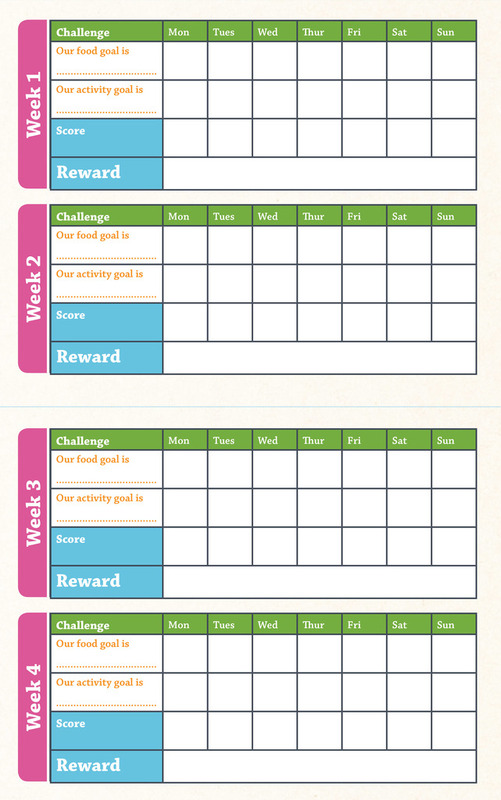 Stick it on the fridge, and make weekly food and activity goals – along with the reward for reaching them. And speaking of rewards, we’ve even created a #LidlHealthHacks Family Reward Chart for you to use at home. Getting the year off on the right foot can be easy, manageable and affordable when you shop at Lidl. You’ll find a selection of fitness essentials and healthy cooking wonders in store over the coming weeks… and all at prices that are sure to put a spring in your step. Email “7 simple hacks for a healthier lifestyle”. Feedback on “7 simple hacks for a healthier lifestyle”.